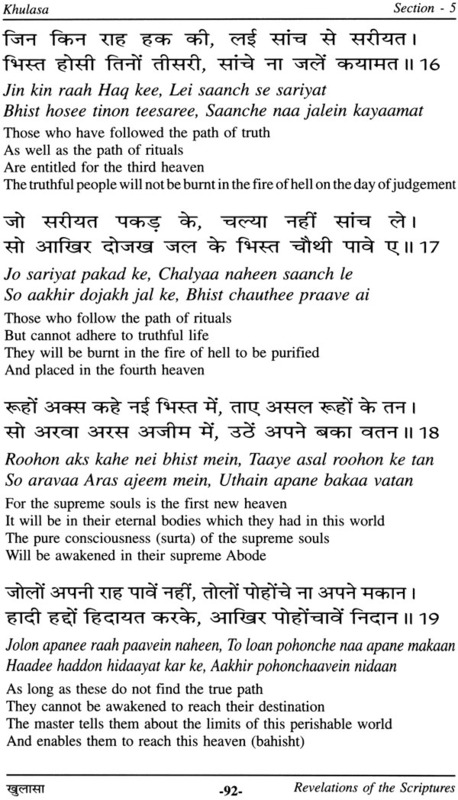 The Lord (Mahamati) has come in this world to perform three jobs. He will resolve all the disputes whether these are related to world or religion. As their languages differ, so they have different names for the Lord. 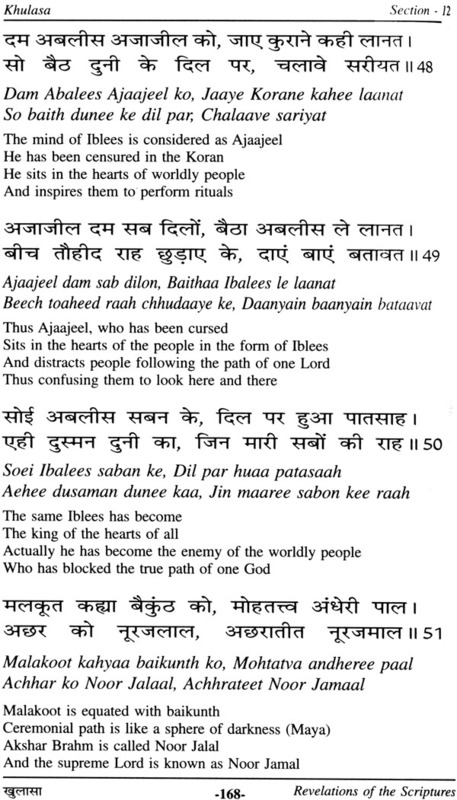 Their mode of worship and practices in the matter are also different, they are confused. The followers of different cults have called the lord with different names. They have different ways to attain Him. 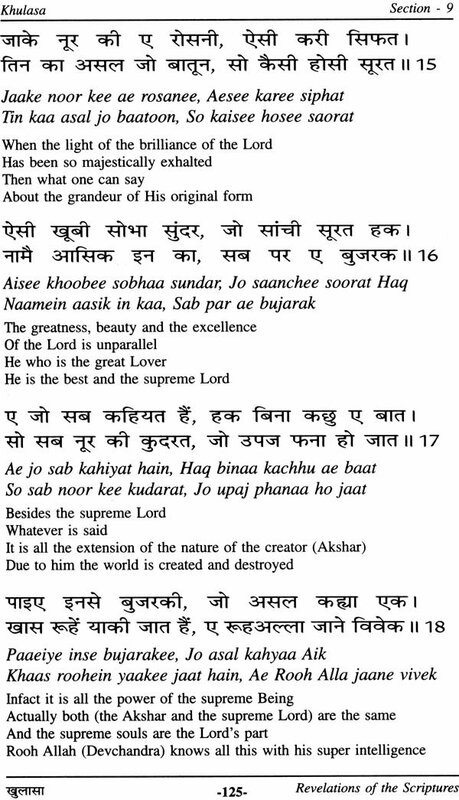 But all of them have one thing in common, that is the God to whom they refer is the only One Lord. 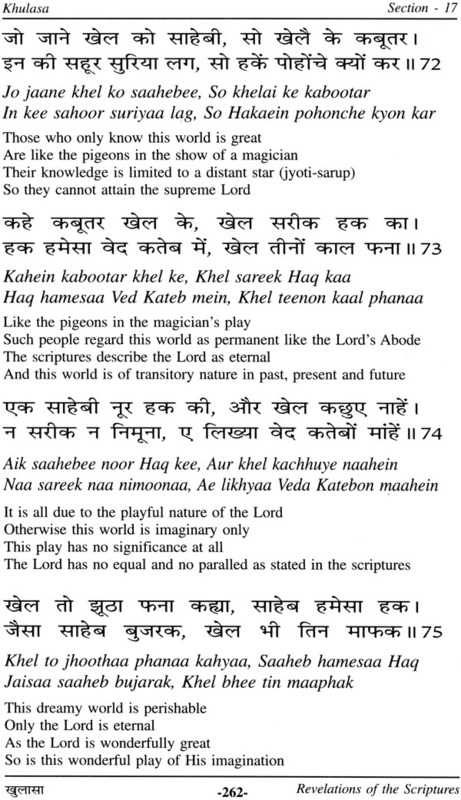 Whatever is stated in Semitic books, the same is written in the Vedas. 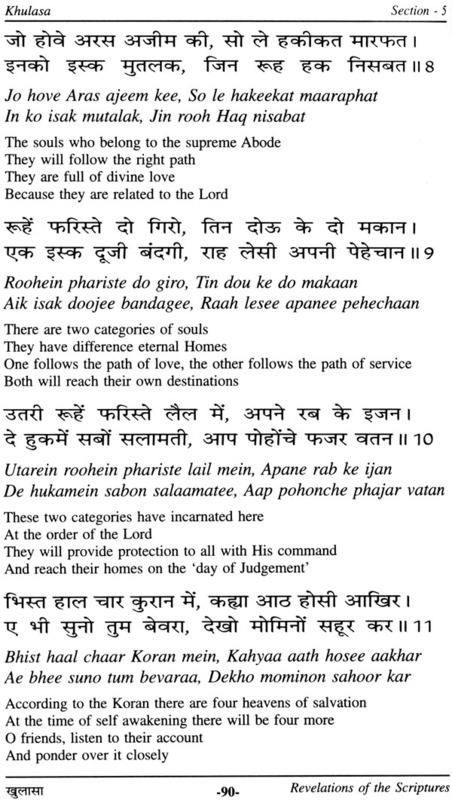 Both Hindus and Muslim belong to the same Lord. They quarrel without understanding this truth. According to their thinking and feelings Budhji met them all and as per their desires, He fully satisfied them. 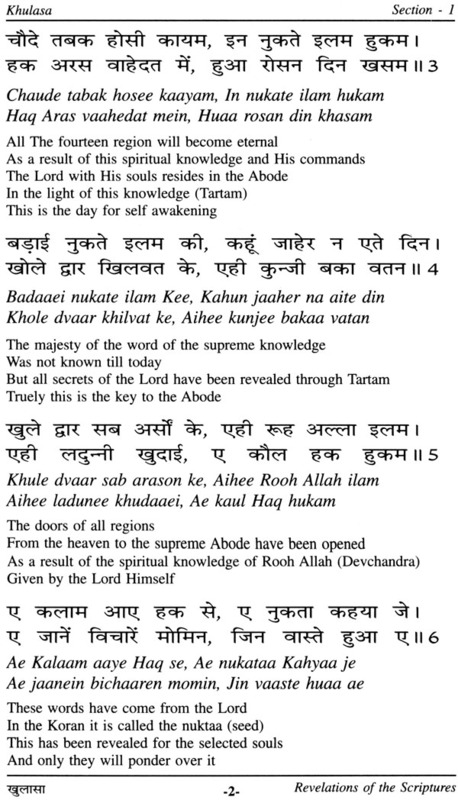 The 'Khulasa' is the book of 'Kuljam Saroop', the most sacred scripture of Krishan Pranamis and was revealed to Mahamati Prannath, the founder of this faith. 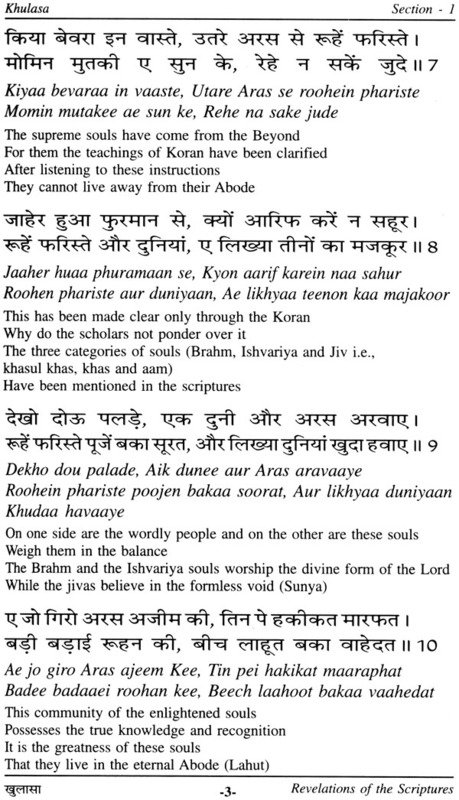 This scripture is also known as the 'Tartam Sagar' because it discusses about different cults, creeds, beliefs and doctrines, not only in their separate form but also in their mixed and blended way. 'Khulasa' means clarification of the subject matter or it being entirely complete. It contains 18 sections and 1020 verses. Its language is Hindi, but Persian and Arabic terms are used at appropriate places. It was revealed to Swami Prannath (also known as the supreme wisdom-Mahamati) during samvat 1738-1743. In the Koran and other semitic texts heaven is called Malkoot, the imperishable lord as Noor Jalal, and the Supreme Lord as Noor Jamal. 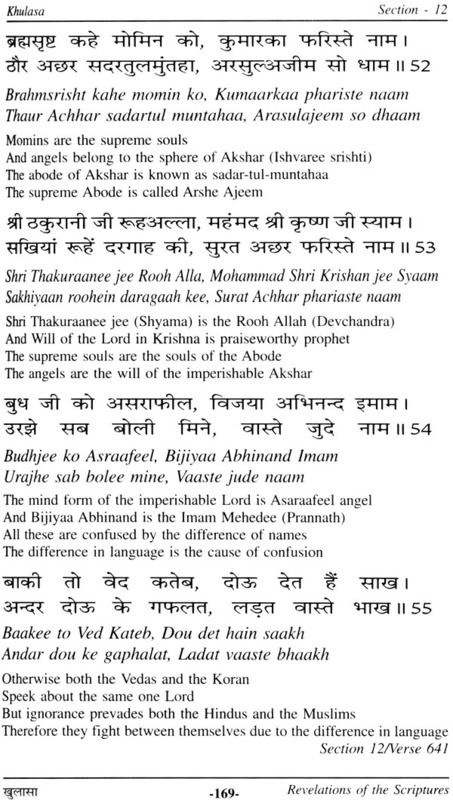 Likewise the superior souls are known as momins, the middle level souls as angels, the abode of the imperishable as sadartul muntaha, the Supreme Abode as Aras Azeem, Shyamaji as Rooh Allah, Krishna as Mohammad, Brahma as Mekaeil, Vishnu as Ajajeel and Mahesh as Izraail. 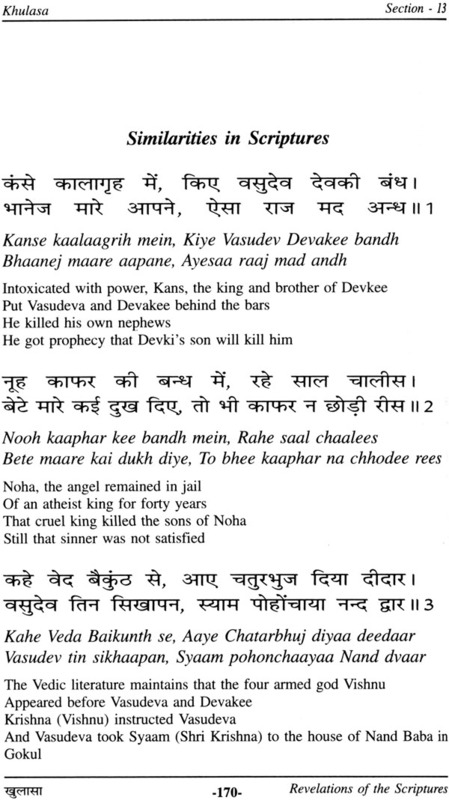 The story of Vasudev given in the Bhagvat tallies with the story of Nooh, the prophet. The amorous acts of Govardhan and Yogmaya find their parallel in the Kohtoor storm and the boat and garden episodes. Thus there are only differences in names and language, but the message is the same. 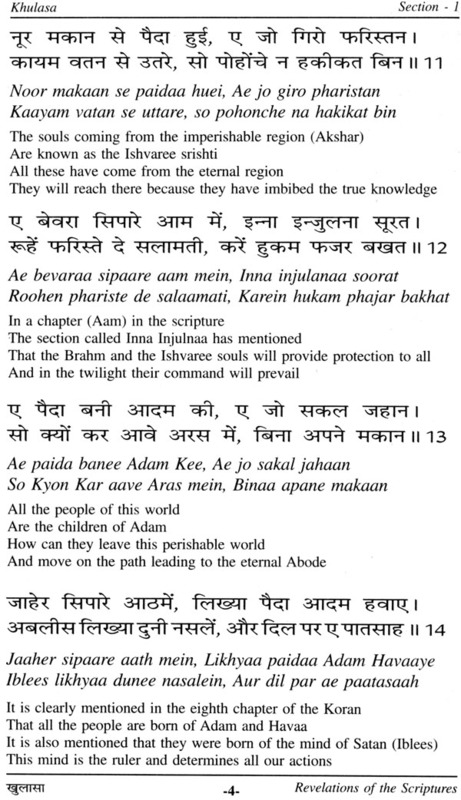 The contents of this book proves that Mahamati Prannath laid the foundation of a world religion. It is hoped that the followers of all religions will give due regards to the religious scriptures of those who hold different faiths. They will find good points in others and the mutual enmity will be destroyed. The man will love the man and religious persecution will come to an end. The teachings of Mahamati are a beacon's light for the world of today. Shri Prannath Mission has resolved to publish the English translation of all the books of Mahamati Prannath, which contain more than eighteen thousand verses. Dr. Raj Kumar Arora has translated several of those books, but this gignatic task needs much more time and dedicated efforts. We have started work in our humble way. The Lord Almighty will give us courage and strength to complete this task and help the students of religious literature to take advantage of our efforts. Dr. Arora deserves our thanks for this work. The contributions of Mrs. Vimla Mehta in this entire excercise of bringing out the English translation of books of Kuljam Saroop has been of great importance. Her tireless and inspiring interest and efforts have made this work possible. 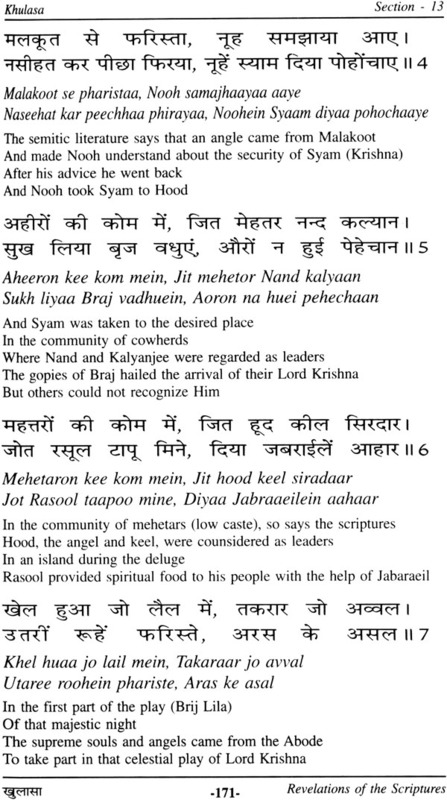 Khulasa is the seventh among the fourteen books of the Kulajam Saroop, the scripture of the Pranami religion. It was revealed to Swami Prannath (1618-1694), the founder of this religion. Khulasa is an Arabic word which means inner meanings, essence or the basis of spirituality. In this book Mahamati Prannath discusses and explains in depth the meanings of the semitic literature with special emphasis on Koran. 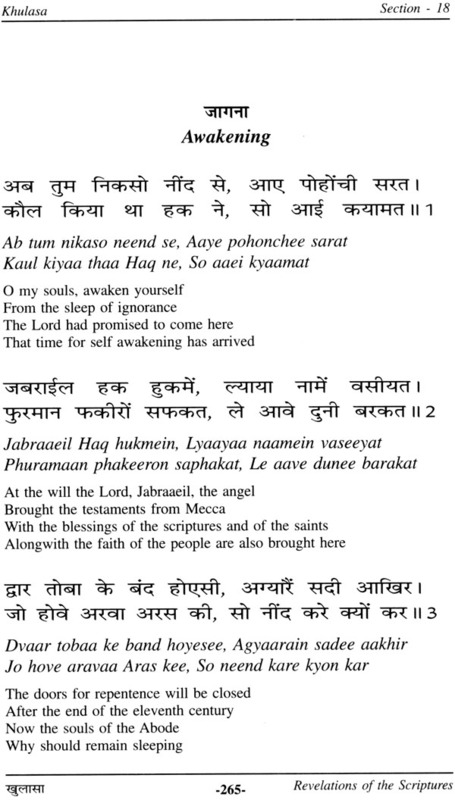 To my knowledge, among the whole literature of the medieval saints the 'Khulasa', the Kayamatnama and Maraphat Sagar of the Kuljam Saroop are the only books which deal exclusively with religions like Islam and Christianity in parallel with Hinduism. 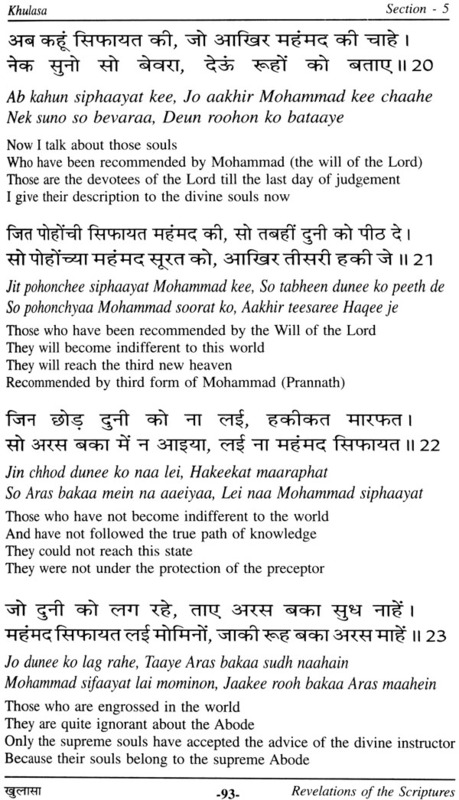 There is a detailed reference to Islam because Prannath ji (Mahamati) went to Arabia on a mission and stayed there for four years. Another beauty of these books is that Islamic terminology is referred to here in details. 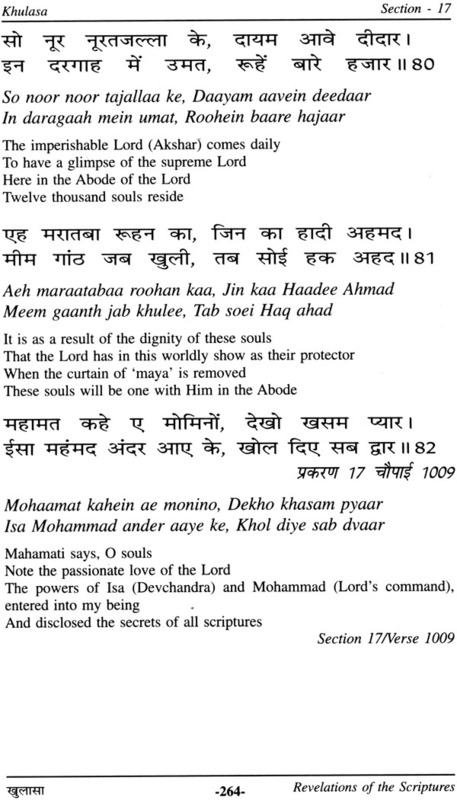 In the verses of the medievel saints a very few references about Islam are given. But in the Khulasa we find theology and vocabulary which are purely Islamic. It seems very clear that a Hindu Saint is correctly interperting the Islamic theology for his countrymen, both Hindus and Muslims, so that they may understand the basics and come to terms with each other and stop the inter-religion conflicts. 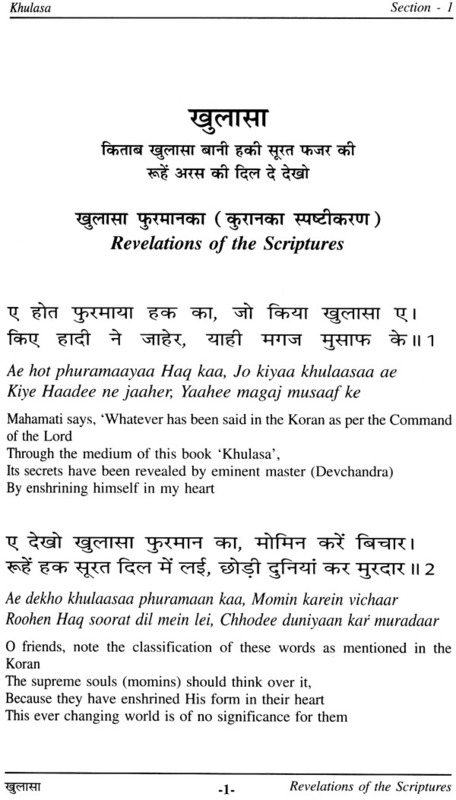 The Islamic vocabulary used in the titles of various sections as well as in the verses in the Khulasa show that Prannath ji was well grounded in the Islamic thoughts and its language. The headings of some sections are:- Koran ka Khulasa, Khulasa Giro Deen ka, Khulasa Meyaraj ka, Khulasa Islam ka, Bhisat Sifaayat ka Bevara, Hak ki Surat, Roohon ki bine dekhaye, Noor, Noor tajalla ki pehechan, Jahoor Nama Kitab, Koran ki Kahun, Soorat Meejan ki etc. Similar is the case with terminology. 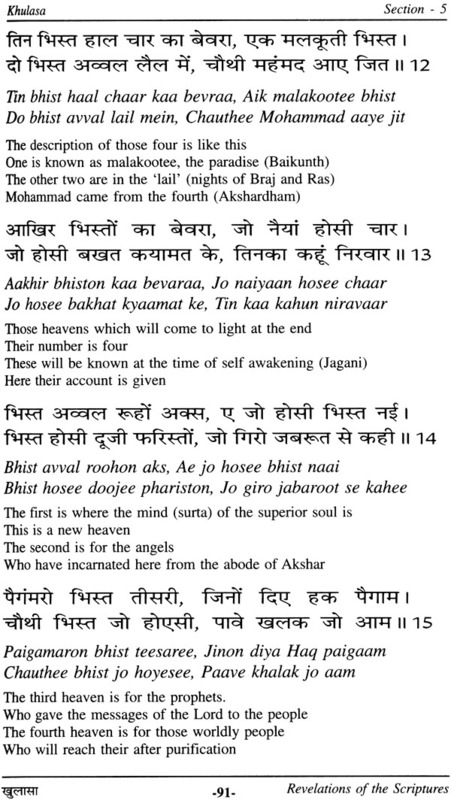 A few words are mentined here:- momin (the supreme souls) chaude tabak, (Chaude 10k) vahedat, (aik Ishwar), khasam (Lord), aras, Rooh Alla (Shyama), Landune (Brahm gyan), baka (Akand) gyan; ilam, Ablees, saitan, phiraste-devta, tauheed, Dajjal, kayamat, Mehedee, Hajrat, Mehboob, dargah, kalaam, murdaar, nisbat, sariyat, masook, khavind, phajar, lailat kadar, paigambar, kafar, Jabraeil, nabee, hauj kausar, Asarafeel, Nazee etc. This terminology has been repeatedly employed in the Khulasa. 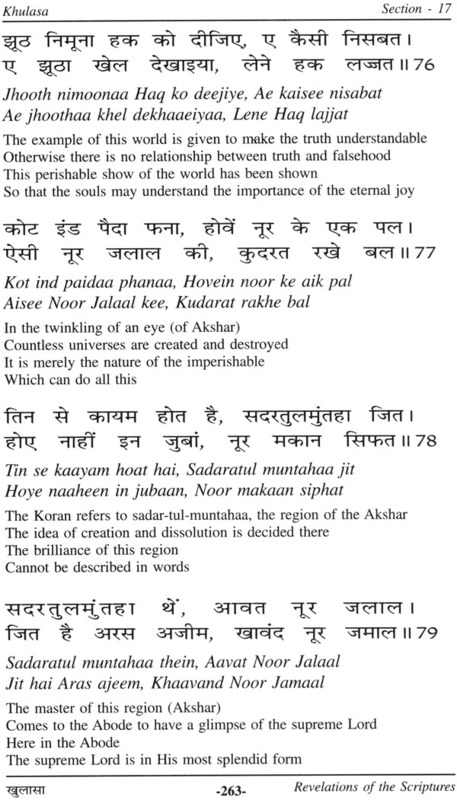 This clearly shows that Parnnath ji was well versed in the most sublime form of Islam not only in its pure essence but also expressions in its own language.